Years ago Martin Luther King, Malcolm X ,Rosa Parks and many others bleed, fought for the freedom of black Americans. Many years after their death, a strong argument could be made that a lot of progress has been made , especially when it comes to race relations. African Americans now have more freedom, then their ancestors and thousands have become very rich or very successful. Even the impossible dream of an African American becoming, an Astronaut, Congressman, Senator, CEO of a major corporation and President has now been realized . Now more than ever there are more African American becoming millionaires and many are enjoying freedom that their ancestors have only dreamed of . But even after all of this success or new found freedom, one still has to ask, Are African Americans truly free or will they ever receive justice? Or are they being mislead into believing that riches or wealth can buy them real freedom? When I read about the shooting death of seventeen year old Trayvon Martin , I can't help but think that African Americans are not really equal or free. No this injustice wasn't committed by a white American, but the lack of justice was still in the hands of a police chief of this race. All over America many African Americans are still suffering from injustices everyday. Everyday, black men or women are being singled out, just because of their race. Many other Americans stereotype Africans Americans as criminals, thugs or as undesirables. One must ask are African Americans wanted or celebrated while performing athletic or musical acts? Are African Americans just entertainment or high priced slaves? When will African Americans be truly free? And where are the people that are suppose to protect Americans freedoms? When will African American celebrities or regular citizen be treated as equals? These days you haven't heard many politicians or elected officials debate these questions or issues. But the question I would like answered today , Is why in the year of 2012 was a African American male allowed to be killed or gunned down, in the streets of his own neighborhood because of his race? 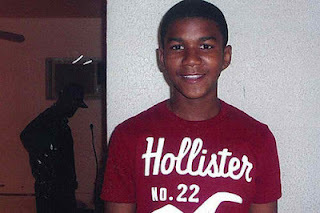 Why wasn't there an arrest and where were the people that were suppose to be there in this young mans time or need? Who protected and served him? Justice? You tell me! Write in and give your thoughts or opinions on the subject. P.S. My late grandmother had a saying that I'll never forget, "Its better to stand for something, than nothing at all". In other words fight for what you believe in and don't take no for an answer. As Americans we shouldn't tolerate racism, bigotry, slavery or anything that demeans its citizens. In today's time or century a male or female of any race shouldn't be targeted just because of their race. Our elected leaders should stand up for its citizens. Instead of protecting those who don't need protecting,(the rich) they should instead look out for those who can't protect themselves and that's our innocent children. Wake up America, our children are being slaughtered in our streets while the rest of the world is watching. Is this the America you want your children to grow up in? Speak out and let your voices be heard. Enough is enough and its time to fight for our freedom and let justice be served.